When Christopher Columbus discovered the island of Puerto Rico on his second voyage in 1493, the Conversos on his crew may have been the first Jews to set foot on the strip of Caribbean later named for its “rich port.” Documents show that the voyage was financed with monies confiscated from Jews who fled Spain. Despite that early Jewish connection, and unlike the long history of Jewish settlement on the Dutch, Danish and British Caribbean islands, Puerto Rico did not attract a significant Jewish population until the 20th century. Today, however, its 4 million residents include 2,000 Jews, the largest Jewish community in the Caribbean islands. Visitors to Puerto Rico will find beaches, mountains, valleys, caves, deserts, luminescent bays, the only rainforest in North America and a year-round tropical climate. Its capital, San Juan, is a bustling metropolis of nearly half the island’s total population. Four or five cruise ships a day dock in the historic district of Old San Juan, emptying 1.4 million passengers annually onto its mecca of cobblestoned streets. Juan Ponce de León officially founded the colony of Puerto Rico in 1508. It is thought that Conversos came to Puerto Rico with the conquistadors. Since Spain barred Jews and Conversos to the fourth generation in its territories and even convened courts of Inquisition in Puerto Rico, the Conversos settled in remote mountainous regions far from the eye of the Church. Only a few other Sefardim, mostly from Curaçao and Venezuela, ventured to Puerto Rico’s shores: Judah Cohen of Curaçao was caught trading and was killed by Spaniards in 1723. Isaac de Lirna practiced medicine in the western city of Mayaguez in 1840. When Jews or Crypto-Jews did settle in Puerto Rico, they often adopted Spanish-Christian names like Mercado (merchant) to hide their identities. Scarce documentation has made gathering Jewish genealogical data difficult. Stories abound of Catholic families who recall unexplained Jewish customs, but Puerto Ricans who have tried to research their family backgrounds say they have met resistance from the Church, even when records do exist. It was not until Spain ceded Puerto Rico to the United States in the Spanish-American War of 1898 that the island became more hospitable to a viable Jewish community. Most of the 5,000 American Jewish servicemen who took part in the Spanish-American War returned home; a few decided to remain in the southern city of Ponce. Colonel Noah Shepard married a Puerto Rican and became an early leader of the Jewish community. Rabbi Adolph Spiegel, who served with an American regiment, led services from 1899 to 1905 in Ponce. Former military personnel and administrators helped the island form its legal and fiscal codes and create its court system; public health officials worked to rid Puerto Rico of tropical diseases. Because of the American quota system restricting immigration after World War I, Jews came to Puerto Rico and Cuba while waiting to enter the mainland, and often remained. The community increased substantially during World War II: 400 Jewish soldiers lived in military bases on the island, and the first community Seder was held in 1942. After Puerto Rico became a commonwealth in 1952, Operation Bootstrap accelerated its industrialization. The government offered economic incentives to American manufacturers; Puerto Rico then became an early center of outsourcing. Close to 500 American businesses and industrial plants opened, earning 10 times the profits as their mainland headquarters. Many were owned or managed by American Jews. More recently, some businesses have relocated to the Dominican Republic and Asia, causing a decline in the Jewish population. Fidel Castro’s ascension to power brought a wave of Cuban immigrants in the 1960s, mostly Holocaust survivors who had settled in Cuba. They established businesses in commerce, real estate and banking. The military junta in Argentina between 1976 and 1983 brought yet another wave of Jews escaping repression. In the mid-1980s, about 200 Israelis participated in an agricultural development program occupying 2,000 acres in the mountainous Santa Isabel region, introducing irrigation technology and developing the island’s first commercial mango plantation and vegetable farm. Now called Gan Eden and run by agronomist Yoav Cohen, the farm sells papayas, cucumbers, squash and peppers to distributors in Miami, and indigenous Kitt mangoes to Europe. About 20 Israelis in business and agriculture remain in Puerto Rico. In 2005, the Senate of Puerto Rico approved Resolution 1480, recognizing both the contributions of the Jewish community to the Puerto Rican way of life as well as the friendship between Puerto Rico and Israel. Most of Puerto Rico’s Jews live in the San Juan area, in the Isla Verde, Condado and Miramar neighborhoods, each of which is home to a synagogue of a different denomination. The Conservative synagogue, Jewish Community Center of Puerto Rico-Shaare Zedeck (903 Ponce de León Avenue in Miramar; 787-724-4157; www.jccpr.org), got its start in 1935, when 26 families began gathering in private homes and commercial spaces. The JCC was founded in 1942 to promote social services, entertainment and mutual help. In 1953, the community purchased and remodeled Casa Korber, the William Korber mansion designed by the acclaimed Czech architect Antonin Nechodoma, whose Caribbean designs incorporated the prairie style of Frank Lloyd Wright. The synagogue’s tiered red-gabled roofs surrounded by lush foliage and a massive bamboo tree create a pagoda-like sense of space; inside, its white walls and dark wood décor capture a spare island style. The congregation named itself Shaare Zedeck, after the first synagogue destroyed in Liepzig, Germany. Many Cuban immigrants joined the American-oriented synagogue and gave it a Hispanic flavor. Today, its 250 families support a Hebrew school, preschool, nursery, Hadassah chapter and Young Judaea club. 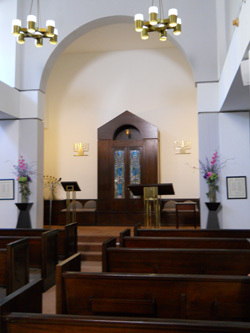 Reform Temple Beth Shalom was established in 1967 by Americans. In 1972, the congregation acquired its present building in Condado, an oceanfront neighborhood (101 San Jorge Street; 787-721-6333; congtbs@coqui.net). About a quarter of its members are Puerto Rican-born converts, many claiming Converso heritage. The building’s seamless, rough-hewn stone exterior features a round stained-glass window with a double Magen David. 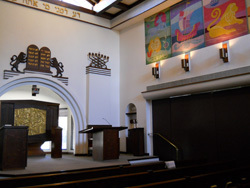 Its sanctuary is similar in design to the JCC-Shaare-Zedeck. Chabad of Puerto Rico, spearheaded by Rabbi Mendel Zarchi since 1999, has made its headquarters in Isla Verde, another tourist destination lined with hotels and condos. The Chabad center is housed temporarily at 17 Dalia Street while its property on 18 Rosa Street is under construction. When it is completed, the new center will house a social hall, kitchen, mikve, classrooms and offices. Chabad (787-253-0894; www.chabadpr.com) also operates a storefront Jewish welcome center at 261 Fortaleza Street in Old San Juan, where it offers maps, information about the Jewish community, local Jewish souvenirs, bottled water, kosher food and Internet access; plans for a library, lounge and Internet café on-site are in the works. Wandering through the narrow streets of Old San Juan, founded in 1521, provides an architectural feast and a journey through history. Two massive forts protect the walled city of only seven blocks. Its neoclassical and Spanish colonial buildings with grille-work balconies and tiled roofs startle and tease in colors from eggshell-blue and mustard to mint green and coral. The Puerto Rico State Department and Governor’s mansion sit side by side with shops, galleries, restaurants, churches and plazas. On weekends, the area teems with craft fairs, music and impromptu dancing. Stop at the Tourism Information Center across from Pier 1 overlooking San Juan Bay for maps and brochures. Columbus is venerated everywhere. A statue of the explorer rises above Plaza de Colón (Columbus Square); dating from 1893, it honors the 400th anniversary of the discovery of Puerto Rico. An obelisk in Plaza del Quinto Centenario (Quincentennial Square) commemorates the 500th anniversary. The rotunda of the Capitol Building depicts another Columbus tableau in mosaic. 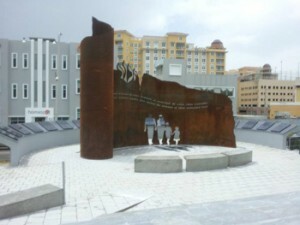 The San Juan Holocaust Memorial, completed in 2012, stands directly across the street from the Capitol. The joint project between the government and Jewish community features a sculpture designed by New York-based artists Michael Berkowicz and Bonnie Srolovitz entitled In the Shadow of Their Absence. A section of the plaza is dedicated to victims of the Lod Airport Massacre of May 30, 1972, when 16 Puerto Rican Christian tourists were among those killed by a Japanese terrorist group recruited by the Popular Front for the Liberation of Palestine. Museums galore offer tributes to Puerto Rican culture, history and art. 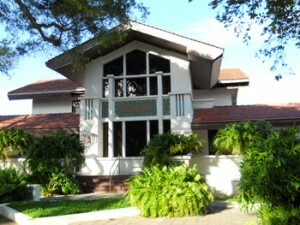 Elmer Adler, designer, typographer and printer, founded La Casa del Libro (House of the Book, Calle Cristo; 787-723-0354). Its rare collection of 5,000 manuscripts and books, some dating to the 15th century, include two royal mandates signed by Ferdinand and Isabella in 1493 concerning the provisions for Columbus’s second voyage. The San Juan Cathedral (153 Calle Cristo), the second oldest cathedral in the Western Hemisphere (1540), damaged by hurricanes and restored in 1917, holds the marble tomb of Ponce de León. Along with the medieval San Jose Church, it may have been one of the centers of the Inquisition. The massive El Morro and San Cristobal fortress system (787-729-6960), a World Heritage site and marvel of engineering that took 250 years to complete (1539-1790), protected Spain’s claim to the wealth of the New World. The forts were used as bunkers during World War II; you can still see a replica of the Spartan conditions that the soldiers endured. Demel Fine Jewelry (267 San Francisco) and Joyeria Demel (261 Fortaleza, next door to the Chabad welcome center) sell hai necklaces among other jewelry. Mezuzot adorn the doorways of both shops, run by Greg Demel, a San Juan native and son of an Auschwitz survivor who made his way to Curaçao and Cuba before settling in Puerto Rico in the 1960s. For a dash of fun, board the ferry to Cantano from Pier 2 (50 cents for the ferry and a $3 taxi ride each way) to Casa Bacardi, where you can tour the rum factory and sample two free drinks. All unflavored Dark, Light & Gold Bacardi rums are kosher without a hekhsher on the label. A competitor, Don Q Rum, does feature an OU on its labels. The Bacardi distillery is on the site of the former Carioca distillery, founded by Sidney Kessler. On a more pedestrian level, Jose Efron Avenue, a connecting road between Highways 693 and 696 in Dorado, was named for a Jewish developer, entrepreneur and banker. A Holocaust survivor, Efron donated the land and construction of the road and also built 10,000 low- and middle-income housing units to advance the socioeconomic development of Puerto Rico. Other commonplace sights include Doral Bank, founded by Salomon Levis, and Pueblo Supermarkets, founded by brothers Harold George and Milton Toppel. The sumptuous El San Juan casino and hotel in Isla Verde (now a Hilton property) was the handiwork of Lou Puro, a developer and hotelier who revitalized the hospitality industry and transformed Isla Verde into a booming tourist hub; he also built the El Conquistador Hotel in Fajardo (now a Waldorf hotel). The Holocaust Museum of Puerto Rico in Morovis, about a 45-minute drive away from San Juan, is one-of-a-kind—located in, founded and supported by a church, Iglesia Cristiana Ministerios Unidos. Begun in 2007 as a small exhibition for students, churches and camps, it has grown to a full-fledged museum with photographs, articles, books and documentaries. The museum’s purpose is to work toward eliminating prejudice, bullying and violence, and educating Puerto Ricans that “when you know history you do not repeat it,” according to a museum representative. Affiliated with Yad Vashem in Jerusalem, the Anti-Defamation League and other associations, the museum (787-930-8793; museoholocaustopr@gmail.com) is located at 618 Bo Patron Street. Free admission and open by appointment. Don’t miss El Yunque (www.fs.usda.gov/elyunque), the 28,000-acre rainforest about an hour’s drive away, where 289 species of trees defy gravity in search of the sun and 120 inches of rain fall each year—but there are no mosquitoes. Listen to the call of the one-inch coqui frog, Puerto Rico’s national symbol, and see if you can spot the tiniest orchid in the world. Estelle Irizarry, former professor of Hispanic literature at Georgetown University and author of 40 books, explores the mysteries of Columbus’s identity in Christopher Columbus: The DNA of his writings and Christopher Columbus’s Love Letter to Queen Isabel (both Ediciones Puerto). Jane Frances Amler also delves into Columbus’s background in Christopher Columbus’s Jewish Roots (Jason Aronson). Harry Ezratty is the author of 500 Years in the Jewish Caribbean: The Spanish & Portuguese Jews in the West Indies (Read Street). In Emily Goldberg Learns to Salsa (Penguin), a young adult novel, Micol Ostow draws on her own Jewish and Puerto Rican roots to tell the story of a young Jewish girl who travels to Puerto Rico for her grandmother’s funeral. Jack Delano, who arrived in Puerto Rico in 1941 as a photographer for the Farm Securities Administration and became an important supporter of the arts and film industry, gathered his own photographs in Contrasts: Forty Years of Change and Continuity in Puerto Rico (Smithsonian). The Freddie Prinze story (Masters Press), written by Prinze’s Puerto Rican-born mother, Maria Pruetzel, honors the star of the 1970s television show Chico and the Man whose father was a Jewish Hungarian immigrant to New York. Prinze committed suicide in 1977. Can You Hear the Laughter? The Story of Freddie Prinze tells the story on DVD. He was the father of actor Freddie Prinze Jr.
Puerto Rico An Oral History 1898-2008 (Read Street), edited by Barbara Tasch Ezratty, includes chapters on Bill Topp, the founder of the JCC, and the Toppel brothers. What’s Cooking: Que se cocina en Puerto Rico: An English-Spanish Cookbook , was originally published as the cookbook of Temple Beth Shalom (Read Street, edited by Ezratty). Louis Sulzbacher served from 1900 to 1904 as justice of the Puerto Rico Supreme Court; Aaron Cecil Snyder was appointed associate justice by Franklin D. Roosevelt in 1942 and was named chief justice in 1953. Leo Stanton Rowe was director-general of the Pan-American Union, which codified Puerto Rico’s laws. David Helfeld was the longest-serving dean of the University of Puerto Rico School of Law. Sidney Kaye, the father of diagnostic clinical toxicology, developed the blood alcohol detection method and introduced the .10 blood alcohol stipulation as the legal limit. Well-known Puerto Rican actors and entertainers who are either Jewish or have Jewish roots include Joaquin Phoenix; journalist and television personality Geraldo Rivera; magician David Blaine; salsa singer Brenda K. Starr; and Marco Montiel Katz, trombonist for Charlie Palmieri. Quiara Alegria Hudes wrote the book for the Broadway musical In the Heights and was a Pulitzer Prize finalist for her play Elliot, a Soldier’s Fugue. Sandy Alomar played for Major League Baseball’s the Padres and Mets. Chabad provides myriad services for tourists. On its Web site you can sign up for a Jewish tour of San Juan that includes sights and synagogues, order kosher meals for pickup or delivery and get special rates on hotels and tours. A Kiddush is always available on Shabbat mornings and a Pizza Café is open on Saturday nights. The boutique Beach House Hotel (www.thebeachhousepr.com), a seaside oasis with minimalist rooms, is a 20-minute walk along the beach to Chabad. Jewish owner Lillybeth Gracia welcomes guests to eat their kosher Chabad meals on the hotel grounds. For strictly vegetarian restaurants, try Verde Mesa (201B Calle Tetuan; 787-390-4662) in the heart of Old San Juan. La Buena Mesa de Oscar (1160 Avenue Americo Miranda; 787-783-1344) serves Puerto Rican-style food in Rio Piedras. Search complete lists of restaurants at www.salpr.com or at www.vegguide.org. While the average year-round temperatures hover around 80 degrees, summers are more humid, and the hurricane season stretches from June to November, when hotel rates may also be cheaper. For more information, contact the Puerto Rico Tourism Company (800-866-7827; www.seepuertorico.com). Explore Puerto Rico from beach to bay and forest to fortress, and enjoy the riches of its Jewish spirit. El Yunque is the only tropical rainforest in the US parks system, not the only rainforest in North America. There are two temperate rainforests in North America, and tropical rainforests throughout Mexico, Central America and the Caribbean, ALL part of North America.